Yes, that is a dime in the upper-right hand corner of the box. These strawberries taste waaaaay better than they look. In fact, if you have never tasted Japanese fruit, my heart bleeds for you. 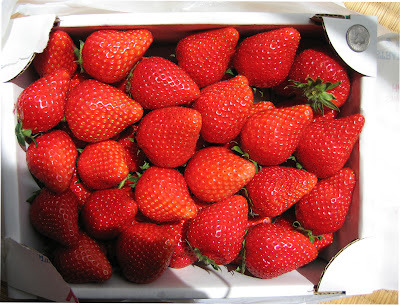 Japanese are always amazed that we put sugar on American strawberries, because these little darlings are so sweet, so juicy, so so so....strawberry, that words simply cannot describe them. And the peaches are even better. A single peach will perfume a room and the first time I tasted one, I actually cried. It was indescribable. With a few exceptions (cherries and Eastern Shore melons) American fruit is fit only for jam. Speaking of fruit, more or less, yesterday's perusal of my local bookstore reveals that the newest Japanese "knitting" fads are crochet and felted desserts. There was an entire book full of appealing felted fruit tartlets, felted cookies, felted donuts, and felted cakes.I could not think of a single reason to purchase this book, as I am not much interested in either felting or fuzzy shortcake, but if anyone absolutely must buy it, I will write down the ISBN number the next time I see it. Next week, I shall venture to Yuzawaya, which is kind of an upscale Michael's. A very upscale Michael's, with two floors of every craft item you can think of. The yarn department is about the size of say, a quarter of a Wal-Mart. I shall report back and try to take an illicit photo. Harry waves all eight arms and says "Hi" to his fan club. So, as I was stepping across the gap between the airplane door and the jetway, my luggage ticket flipped out of my passport and floated gracefully down to the runway. They had to hold the plane while someone chased it around the tarmac. "The captain said for you to hold on to this." fleegle sinks down into her seat until she is about the size of a kumquat and about the same color. I need to knit this sweater for, um, erm, Laptop the cat? She might wear it more gracefully than anyone else I can think of. Packing for a three-month trip might seem difficult, but we have complete household in Japan, so all I need to take are food, yarn, gifts, and American underwear. After ten years, I know to the milligram how much peanut butter, bread, cheese, and coffee I'll use per week. 1. Coffee is about $30 a pound. 2. Japanese bread is more useful as Kleenex, but not as tasty. I once left a split baguette of "French bread" on the counter overnight, and I swear to you that it evaporated. Most of the white stuff disappeared, leaving a dried rind of white inside the brown crust. 3. Cheese, if you can find it, runs $20-$30 a pound. The Japanese don't like flavorful cheese, so the choices are Camembert that tastes like soap, brie that could pass for unflavored gelatin, and cheddar that resembles orange tofu. I once saw cheese-flavored tofu in the supermarket and figured it was probably developed by the Department of Redundancy Department. 4. Peanut butter is actually medicine. Where I stay, the food is light on protein and taste--vegetables boiled to mush, indescribably ghastly fish, undercooked chicken, and tofu. I can eat the vegetables, but I just can't swallow the protein components. During my first extended stay, I developed protein deficiency. This, believe it or not, was diagnosed by my hairdresser when I returned home. I won't bore you with the symptoms--suffice it to say, they were extremely unpleasant and peanut butter was recommended as a daily diet additive. It's also useful as bribes, because crunchy peanut butter is unknown in Japan. The two outside skeins of sock yarn in the top photo are proto-gifts that I will finish during my stay. 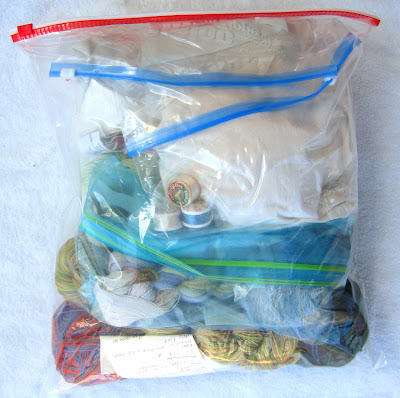 There's another bag of gift sock yarn for a dear friend, too, but I don't want to spoil her surprise by showing it here. As for the underwear, well, Japanese ladies seem to favor garments encrusted with itchy lace, embroidered pictures of Hello Kitty, or metal bits, all presented in colors that would burn out the eyeballs of anyone who stared at them for longer than ten seconds. All that remains is to shoehorn everything into a single 50-pound suitcase, plus a carry-on bag, find my passport, and grit my teeth for the unpleasantness of airports. Blogless Susan posted a wonderful explanation of superimposed knitting, but she pinned it as a comment to another, much later, post. So, for those of you who missed these entries the first time around, I am combining my original blog posts with her how-to description. 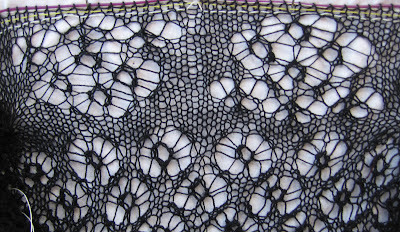 By an amazing coincidence, the book I reviewed in another post, Creating Original Hand-Knitted Lace, also contains written instructions for using this technique on a set of baby clothes with pretty lace edgings. 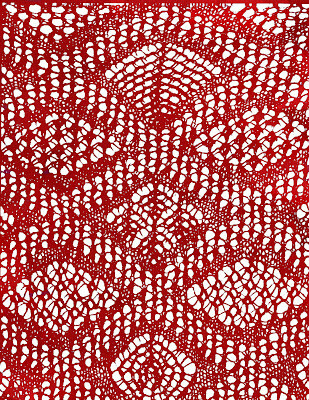 In short, the technique is similar to, but different from, double knitting. For the shell motif I cast on 15sts using a strand of both yarns. Purl 5 using both strands, then the fiddly bit. Separate the yarns for the next 5 stitches. Put the colour to be patterned on a dpn at the front, and the pattern background sts onto the left needle. Then, using the pattern colour and right needle, pattern across the 5 stitches. Drop the pattern yarn, pick up the background yarn and using a dpn work the 5 background stitches, pick up the other yarn and work the remaining reverse ststs with both yarns. 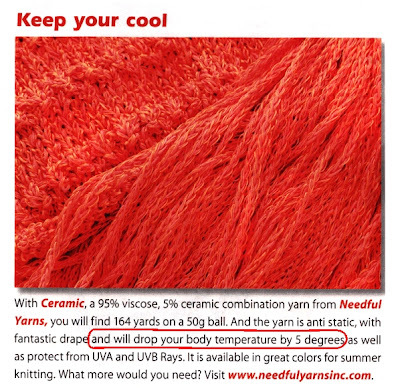 So, you need 3 needles, or two longs circs (but I hate circs). It becomes obvious pretty quickly when to change yarns and needles. When you need to incorporate one of the edge sts into the pattern you just separate the strands (ie row 3), or knit two together with two strands when you need to decrease the pattern number (ie row 9). Working more than one motif across the row is a bigger pain. You really need to use 2 circs, as there is very little flexibility when using straights. I put all the pattern background onto one needle at the back, and the patterns and reverse stst on the front needle. Lots of fiddle working across the row - needles and yarn all over the place. But the finished product looked good. I found this pattern (and several others like it) in a Japanese pattern book. Look closely at the picture. You'll see that there are two layers of knitting here. What? How did they do that? Any ideas? Here is another example of superimposed knitting that I talked about yesterday. Both of these are from the book 1000 Knitting Patterns. The book is in Japanese, and available here. 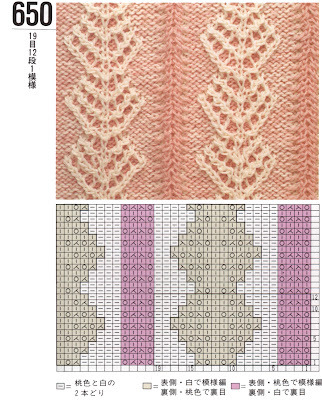 Like all Japanese knitting pattern books, it is lavish and full of unusual, elegant patterns. There's an entire section on multicolored cables, something I've seen only one other knitting book ( a really old pattern book that I am too lazy to go look for right now). 1000 Knitting Patterns weighs a ton, and costs the earth ($60). I hauled it back to my apartment in Japan on the train, in August, so I know how much it weighs. As with all Japanese knitting books, everything is charted, so rarely will anyone have trouble following the patterns provided he or she has invested in a Japanese knitting symbol dictionary. For those still searching for one, go here. Body temperature drops by 2°C - 4°C (3.6°F - 7.2°F, or between 95°F - 91.4°F). Shivering becomes more violent. Muscle miscoordination becomes apparent. Movements are slow and labored, accompanied by a stumbling pace and mild confusion, although the victim may appear alert. Surface blood vessels contract further as the body focuses its remaining resources on keeping the vital organs warm. Victim becomes pale. Lips, ears, fingers and toes may become blue. Difficult to knit with all that miscoordination, shivering and stumbling. Isn't it amazing what marketing folks will write into advertisements? The new edition is slated for June, 2007. Someone emailed Margaret Stove and apparently, there will be a new US edition soon. So be patient and ignore the $60 copies that are floating around. This is the second interation of the design for my August class. 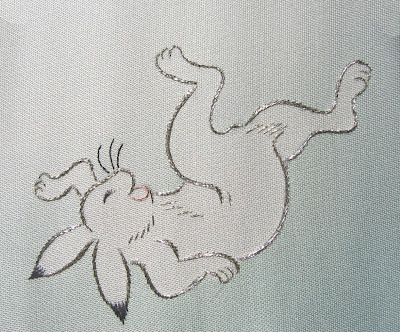 The first one was stitched with flat silk, this one, with fine metal thread. I also made everyone look happier. I have one more to do, but I won't work on it until I come back from Japan. 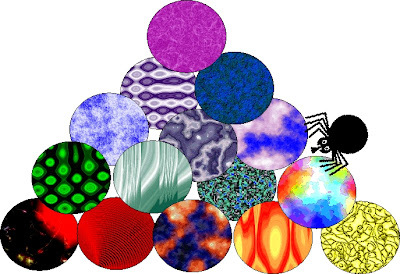 Click on the pictures for a full-sized view. Hope they make you smile! Well researched and a bit of an eye-opener about "yarn for the masses." Go here. 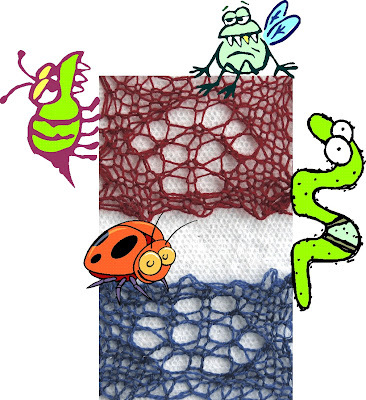 Black Widow Spider King Inner Border--Complete! Sorry the pin-out is so sloppy--it's a strain to show anything without risking the stitches sliding off the needle. It's a looooooooong way around each row, especially as I am being exceptionally careful not to make a mistake. Each row takes about an hour, and that's when I am feeling particularly coordinated. I was flabbergasted that my stitch count came out perfectly--I didn't have to fudge a single stitch to begin the extremely complex outer border. Alas, BWSK isn't going to Japan with me. I don't want to risk losing it in my checked luggage or having it confiscated from my carry-on by a surly TSA person. And the lighting in my room over there is, um, subtle--a bit too subtle to work with fine black yarn. On the positive side, I look thirty years younger, assuming I can find a mirror in all that subtleness. 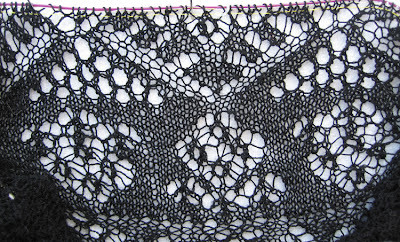 Instead, I will begin the Unst shawl and knit up to the beginning of the pattern. That way, if something happens on the ride over I won't be heartbroken. Well, overly heartbroken. As usual, I have already made some adjustments to the Unst shawl pattern. I preferred the original center shown in Heirloom Knitting, so even though I paid for the standalone pattern, I am just mutating the stole into a shawl, as (sort of) decribed in the book. I know that books don't mumble, but if they did, the paragraph for the conversion would be an excellent candidate for literary mumblehood. The arithmetic made my head spin, but I finally worked out both the vertical and horizontal repeats for a square center. 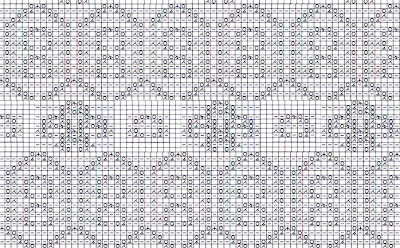 I figured the author ran into the same problems I did trying to shoehorn the original center into 165 border stitches, so she went with a central pattern that didn't require so much modulo arithmetic. I'll finish the center while I am there and then begin the border when I get back in July. And, while I am there, you guys will be treated to lots of Japanese yarn and books. 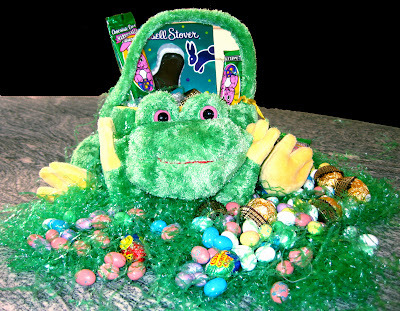 The Easter Frog pays a visit to your house! 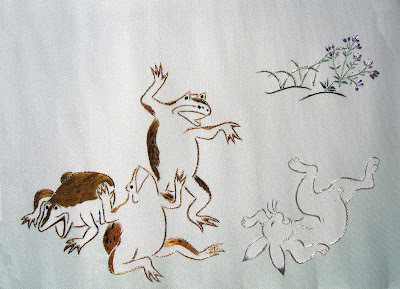 The Easter Frog, as we all know, come from the same place as the Easter Bunny. If you know where that is, please let me know, will you? Nancy, please come up here are help us empty the Easter Frog, so I can use it as a knitting basket. And Lori, we found the bug. Very clever, hiding it inside a Whopper. What was especially interesting about the results was that the Blues tended to vote in the morning and the Reds in the evening. I am sure a psychologist could have a field day with this information. Are Blues morning people and Reds night prowlers? Or is it the amount of daylight present that skews the vote? Or is breakfast a bluer meal than dinner? Anyway, Harry was still waffling, and promised to dust the shoji screens if I would knit some swatches. 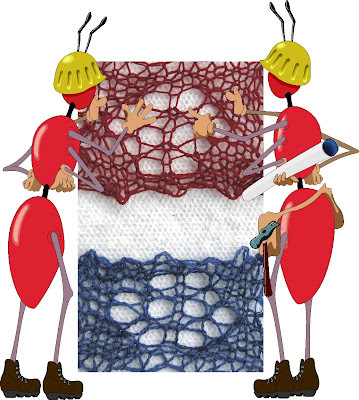 Harry had the swatches evaluated by two engineer buddies, who thought the Gentle yarn had more structural integrity. Of course, structural integrity is all well and good, but he wanted some subjective opinions too. So he called Bertie, Elvis, Winston, and Nagini over to take a peek. I have to say that, while I was really, really leaning towards the blue when comparing the skeins, the red looks so much richer and blocks out with more character. This stuff is just fabulous to knit with. It is quite elastic, allowing needle acrobatics that would stretch or break other yarns. It feels heavenly and comes in 33 gorgeous colors, too. Gentle is cobweb weight (6265 yards/lb), but if you are in the market for something finer, check out Yarn Place's Angel (8323 yards/lb). It's 100% merino that feels like cashmere and comes in 16 lovely colors. To give you a comparison, Heirloom Knitting's Merino Lace is about 7000 yards/lb and their Gossamer Merino is about 11,000 yards/lb. The former comes in 28 colors and the latter in naturalwhite/ecru. 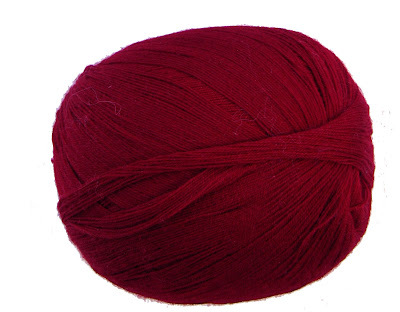 I ordered some of the Merino Lace a while back, but thought it oddly coarse--I'll trade it away at some point. The Gossamer feels wonderful, but I can't see myself knitting white for months on end. (Lyn, if you are reading this, we need some gossamer-weight Gentle!). And so, to sum up this mildly rambling post, even though the blue color shimmers from the hand of an expert dyer, the red is just more appealing. Furthermore, the red goes better with Harry's complexion and most importantly, would be more difficult for the covert ops folks to track me via satellite. A few weeks ago,I emailed Harry to see what he's been up to this winter. He told me that he spent the winter knitting hats for everyone. After he found most of his efforts adorning cabbages in the garden, he stormed off to the bathroom in a snit. 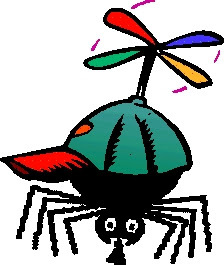 Not feeling very sociable after the hat debacle, he spent the rest of the winter making extensive renovations to his web. 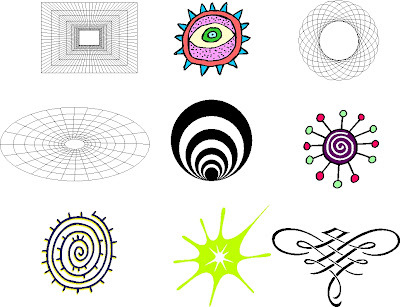 Although most of his concepts clearly missed the point of webness, he felt the creative flair would make up for the lack of practicality. He could scarf some fly snacks from everyone else's boring, utilitarian webs while they were off slaving in the workshop. After complimenting him on his originality, I suggested he cruise the laptop thoughtfully left under the table for something more, um, traditional. His little heart is now set on completing Sharon Miller's Unst shawl for this year's exhibition, but he was having trouble deciding what yarn and color would work best with this exquisite design. We hooked up a video conference and he did a virtual crawl through my stash. Most of my puny pile received eight thumbs down, but he did like the the Dark Ruby Gentle from Yarn Place. "Rich color," he said thoughtfully. "Goes well with my complexion. A bit too warm-colored for Unst, perhaps." Harry dug deeper into the pile, falling fast asleep inside a skein of alpaca silk. After an hour of snoozing, he resumed his perusal. "I kind of like that Zephyr in Marine Blue," he said, "But the yarn is way too heavy for the Unst shawl." "However, this Grignasco Merino/Silk is the perfect weight and it's almost as soft as spider silk, so do you think you could maybe get it dyed Marine Blue for me?" We did some bickering that involved mosquito removal and web dispersal before my arrival, to which he agreed with rather good grace for a spider (that is to say, a bit snarfy). Harry's yarn arrived the other day, and the blue is just stunningly gorgeous. Harry asked me to post his pictures and see if his eagle-eyed audience might weigh in with their opinions. He's still fooling with it, but we'll both keep you posted.